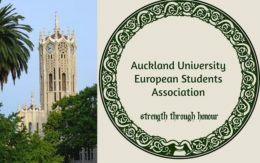 “Abort” is not too strong a word, as the planned Auckland University European Students Association was seemingly obliterated before it got going, unless it has plans to exist in another form or dimension. The association obtained permission to man a display for recruitment during Orientation week in March at Auckland University. Having just seen the association’s Facebook page, which seems to now have been deleted, at least temporarily, the association described its purpose as including Medieval re-enactments, feasts, and hiking. I can quite understand why something as potentially fascistic and militaristic as hiking could evoke the paranoia of the Left. After all, the Wandervogel groups in Weimar Germany were a prelude to the Hitler Youth. One should not encourage healthy pastimes among European youngsters; who knows where it might lead? Auschwitz here we come . . . The liberal thought-police might also want to investigate the popularity of Medieval re-enactments in New Zealand, which is intrinsically Eurocentric and therefore implicitly genocidal. Another matter of grave concern was that the Facebook of the European Students Association included Celtic Knots. The Celtic Knot, state the thought-police, is used by “white nationalist” groups. Our Race Relations commissioner, Dame Susan Devoy, whose qualifications for that job consist of her acumen as a squash champion, stated that although she is proud of her Irish heritage, she will be keeping a close watch on the European Students Association. What makes an Irish or a Celtic dance society acceptable, but not a more generalized “European” society that includes Celtic plus other European heritages? In order to become acceptable the association would presumably have had to form separate but affiliated ethnic groups for each European ethnicity, with say one member forming an Irish branch, another the Slavic branch, one the Italian, branch, another the Swedish branch, then forming an umbrella group but without the name “European.” Presumably “White” or “Aryan” would also be unacceptable so one is left wondering exactly what name would be acceptable. The conclusion must be that none would be acceptable. Anything of a “European” character is going to be innately objectionable. The motto of the association, “Strength through honour,” was going to be problematic. There were allusions to the SS. However, any motto that included the word “honor” was going to be objectionable. The word implies chivalry, knights, warriors: Europe. How can the word “honor” be looked at as anything other than objectionable by those who intrinsically lack honor, do not understand honor in others, do not have it in themselves, do not and cannot identify with any heritage that is based on honor? The word “honor” used in any context was going to be associated with the SS by these types. So one must not promote honor as a European value. Another objection was the inclusion of Captain James Cook on the association’s Facebook page. Cook was the first Englishman to discover New Zealand. The Dutch had come before him, but did not think sufficient of the place to bother further. The Maoris invited the British to incorporate Maoriland into the British Empire in the hope that British order and law would compel them to stop slaughtering each other, but the legacy is something that cannot be other than one of shame and guilt according to the Left. Captain Cook is a proto-Nazi and a white supremacist, and what is more part of white male patriarchal society. The association might just as well had Hitler or Nathan Bedford Forrest adorning their Facebook page. So the number of breaches offending liberal sensibilities on one brief Facebook page were substantial: “European,” “honor,” the Celtic Knot, Captain Cook. Auckland University Students Association president Will Matthews was of course vocal in his opposition to the registration of the association as a university club and its presence at Orientation week. Watching Mr Mathews on the TV One news link provided below one might discern a certain, predictable, type. Mr. Matthews is a blogger for a two-man project of Left-wing banality they call The Left Estate so he had a political bias that he was incapable of putting aside in the interests of objectivity . . . and doing what is honorable. Mr. Matthews is a member of the Auckland University Labour Party. That is defined as a “social democratic” organization; “social democratic” as in the Russian Social Democratic Labor Party, which became the Bolshevik party, which resulted in Kronstadt, the Ukrainian famine, Mao’s Cultural Revolution, Pol Pot’s “killing fields” . . . The Labour Party uses “red” like Lenin, Stalin, Pol Pot. One might object to their use of the word “social democracy,” and to the color red because of their historic associations. Perhaps the existence of the Labour Party on Auckland campus should be scrutinized, considering the legacy of its “social democracy”? Who knows where their socialism might lead? Amongst groups on Auckland campus is the Australasian Union of Jewish Students. The objectives are described as: “Australasian Union of Jewish Students on Auckland campus, we are a cultural, political and religious club, advocating Israel and Judaism on campus.” How inclusive is this outfit? The European Students Association was strictly cultural but non-religious and non-political. Are Susan Devoy and Will Matthews and the sundry bigots who objected to a European culture group able to seriously argue that this Jewish outfit is more inclusive than the European Students Association, or are they being gutless, hypocritical, or both? The Jewish students union mission is to “develop and strengthen Jewish identity on campus . . . enhancing Jewish life.” They are committed to the program of the World Zionist Organization, to promoting “Jewish history and culture,” and serving as a platform for “every Jewish and Zionist student across Australia and New Zealand.” Why is it acceptable for an association to call itself “Jewish,” but unacceptable for one to be called “European”? Why is Zionism acceptable with all the suffering that has caused, yet a non-political, non-religious, culture organisation is not? The European Students Association was presented by Mr Matthews and his ilk as a potential threat to ethnic minorities, but there is not the slightest reason to believe that would have been the case. What was expected? Cross lightings? Beatings with a sjambok? Lynchings? Pogroms? What . . . ? The only threats of violence and expressions of bigotry were those directed against the association.